New year, new toys, new patterns! Happy 2015, friends! I hope that all who celebrated the holidays had many joyful and memorable moments. We had a terrific Christmas filled with family, fun, and delicious food. As usual, my dolly habit was indulged by my wonderful family and I have lots of fun new stuff to show you in the coming weeks. My daughter is enchanted by the revamped American Girl Pets Collection and asked for Coconut and “any of the pet beds” for Christmas. I made a top secret video review of both items before gifting and, fortunately for me, she didn’t peruse the MSF YouTube channel before the big day. 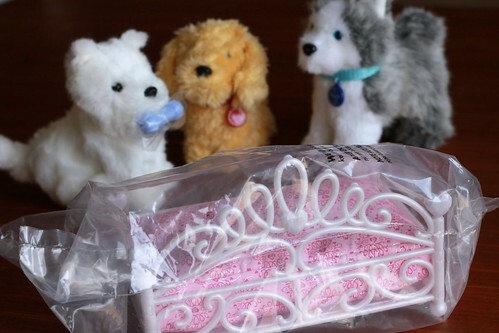 You can check out the video here, but the bottom line is that I was more impressed with Coconut then I expected and much less impressed with the Princess Pet Bed. One of my favorite new toys is a 5th generation iPod Touch! I have enjoyed a much older version for years, but it has been sporting a cracked screen for a few months and it didn’t come equipped with a camera. I’m also the last human on earth to not have a smart phone, so although I’ve been very intrigued by the doll communities on Instagram, I haven’t been able to join the fun with no device compatible with the Instagram app. My new iPod now allows me to snap quick pics and upload them to Instagram or Facebook for instant sharing. Hello 21st century, it’s so nice to finally meet you! I’m also posting the Instagram pictures on Facebook if you are uncool like me and still hang out on Facebook*. *Facebook uncoolness insight also provided by aforementioned teenage sons. Apparently parents ruined it. One of my favorite things about a fresh new year is all the fresh new ideas that flood my imagination. I can hardly sleep with all the patterns and projects floating around in my head. Sadly, daylight hours have not expanded to match my renewed energy, so progress is slow. But bear with me, I have so many fun things to share with you in 2015! Here is a peek at some of the patterns I’m working on. Have you sewn with loose knit sweater fabrics and stretch lace? They are too sheer to be used alone, but I’m developing a pattern for a fully lined dress that looks fantastic with these knits and lace as an overlay. It’s almost finished and will be available at Etsy when it’s ready. I’m also expanding the jeggings pattern to fit better with less stretchy fabrics. I’ve found a bunch of printed sateens (~3% Spandex content) that have a little too much gap in the back without some additional paneling in the rear. You guys.. doll bums are difficult to fit! But I’m soooo close. It’s only taken about 2,403,649 prototypes, give or take. Julie has been a (relatively) good sport, what with all the leg yanking required to get a million pairs on tight fitting pants on and off. She did, however, threaten to stick chewing gum in my sewing machine if I didn’t finish up soon. When this pattern is finished, it will be sent as a freebie to my MSF Newsletter subscribers and then listed for sale in the Etsy store. 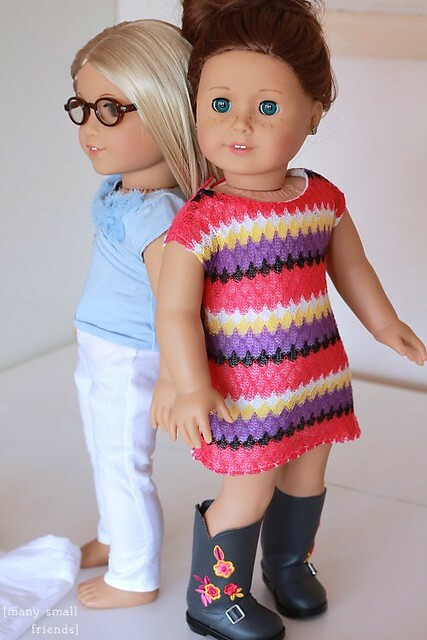 This entry was posted in Doll Review, Doll Sewing, Doll Video, Free Doll Patterns and Tutorials and tagged 18" Dolls, American Girl Pets, Coconut, Doll Review, Doll Video, Many Small Friends Free Newsletter, Many Small Friends Sewing Pattern, Sewing for Dolls.